The Transparent Disaster Relief Act of 2018 would better inform disaster survivors about duplicative benefits and increase transparency around recoupments. Photo by: Office of U.S. Congresswoman Kathleen Rice. Long Island, NY - October 30, 2018 - U.S. Representatives Kathleen Rice (NY-04) and Peter King (NY-02) today introduced a new bill to amend the Robert T. Stafford Disaster Relief and Emergency Assistance Act and the Small Business Act to better inform disaster survivors about which forms of federal assistance could be considered duplicative and result in a recoupment or, claw-back. The bill also requires the federal government to automatically provide disaster survivors with clear information on how they determine recoupment amounts. The proposed legislation has been endorsed by the Touro Law Center Disaster Relief Clinic, which has been assisting Long Islanders affected by Superstorm Sandy since 2012. The announcement was made on the six-year anniversary of Superstorm Sandy on the Long Beach Boardwalk, where Rep. Rice was joined by local elected officials and several Sandy survivors from New York’s fourth congressional district. In the aftermath of Superstorm Sandy, a difficult recovery process was made even worse for many survivors when they learned that they had used duplicative benefits and would have to repay the government for money already spent. A common scenario was when survivors used New York Rising funding for the same recovery purposes as other forms of federal assistance, such as Small Business Administration (SBA) loans or Federal Emergency Management Agency (FEMA) grant funding. Following a major weather disaster like Sandy, FEMA encourages survivors to apply for both FEMA funding and SBA loans, which often arrive quickly, in order to begin the recovery process as soon as possible. After Sandy, Congress also appropriated an additional $4 billion in funding to the U.S. Department of Housing and Urban Development (HUD) to further support New York State’s ongoing recovery effort. This funding was eventually distributed through NY Rising. Eager to rebuild their homes and communities, many Sandy survivors accepted NY Rising funding unaware that it would be considered duplicative to the FEMA funds and SBA loans that they already received and used. As a result, FEMA and NY Rising have sought to recoup millions of dollars in assistance funding from homeowners on Long Island who were simply following the rules. Currently, the Stafford Act does not require federal assistance programs to provide survivors with information on duplicative benefits nor does it provide them with the explicit option to refuse SBA loans. The Transparent Disaster Relief Act of 2018 would ensure that anyone receiving federal assistance signs an acknowledgment statement that includes a comprehensive list of resources that could be considered duplicative benefits. The bill also requires that the SBA clearly notifies all approved loan applicants that they are not required to accept the loan. Finally, the bill requires that anyone who is subject to a claw-back is automatically provided with all the information used by the federal government to determine the recoupment amount. This information is critical to individuals who are challenging a claw-back but is currently only available upon request. Last Year, Rep. Rice was the lead Democrat on the Disaster Assistance Fairness and Accountability Act with Rep. Tom MacArthur (R-NJ), which prohibits FEMA from clawing back disaster assistance funding after three years of initially distributing it to recipients. This bill was included in the FAA Reauthorization Act of 2018 which the President signed into law on October 5, 2018. 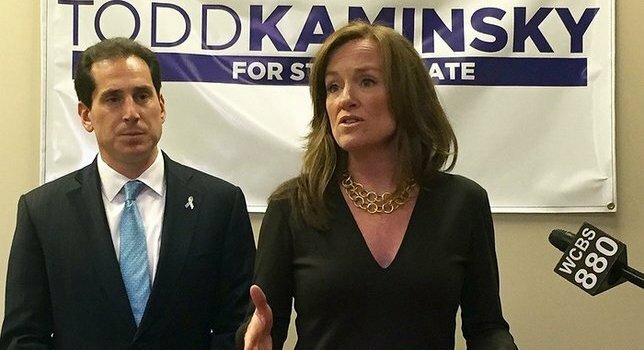 Subject: LongIsland.com - Your Name sent you Article details of "Rep. Kathleen Rice Introduces Bipartisan Bill to Increase Transparency Around Disaster Relief Benefits and Claw-Backs"